Update: English edition The Art of Resident Evil 5 is available now. I've heard of Resident Evil but didn't know that it's actually known in Japan as Biohazard. This is a 208-page paperback with dust jacket. The book was released in May 2009 and I don't know if there's going to be an English translated version in the future. 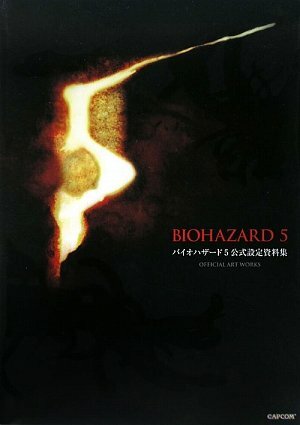 This art book is on Biohazard 5. It contains the concept art for the characters, creatures, zombies, environment as well as interviews and some discarded visual ideas. The art comes in the form of sketches, coloured illustrations and 3D computer graphics. For fans of anything zombies, these book has plenty to delight you. The designs for the undead and creatures are really cool. There are worm infested zombies, rotting dogs, plenty of tentacled disgusting lifeforms and gruesome mutations. This world is pretty sick. The chapters follow the game play, presenting art for the areas and then the enemies there. Compared to the characters, there are less art for the locations although there are some storyboards, presumably for the cut scenes. Right at the end are some photos of actors playing the main characters in front of green screens. This is a recommended art book for the gamers, sci-fi and game artists.